Here’s a low-fat, low-cholesterol and low-calorie chicken dish that’s quick & easy to whip up during the week. Mix 1 1/2 tsp of lime juice, seasoning mixture and cumin. Rub mixture evenly over both sides of chicken. Spray 10 inch nonstick skillet with cooking spray & heat over medium-high heat. Cook chicken in butter/margarine about 8 minutes, turning once, until chicken is no longer pink when center of thickest pieces are cut. Remove chicken from skillet; keep warm. Add remaining 1 1/2 tsp lime juice and the water to drippings in skillet. Heat to boiling. Boil & stir about 45 seconds or until liquid is reduced to about 2 tbsp. 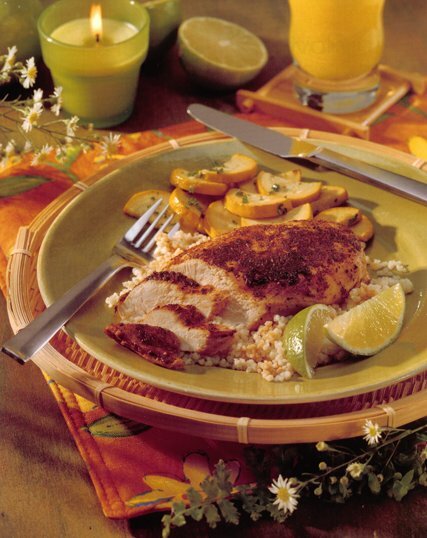 This entry was posted in Chicken, Main Courses / Dinner, Recipes and tagged blackened, chicken, cumin, dinner, poultry, seared. Bookmark the permalink. I love this healthy chicken dish. It’s not only sounds nutritious but also look really easy and simple to make. Thanks for the recipe. Why thank you SO much! I’ll be making that tomorrow night! Love this blog!